If you need wheel alignment service, bring your vehicle into our shop in the Mooresville, NC area for a free quote. If you are driving down a straight road and notice that your car veers left or right, it is probably time to bring it in for wheel alignment service. When your wheels aren’t aligned properly, your tires aren’t pointing straight, so it causes the car to pull to one side. Misalignment will also cause your tire tread to wear unevenly, which decreases the life of your tires. The car parts that control the wheels can also be impacted by poor alignment, which means you may not be able to steer properly and could cause a safety hazard on the road. 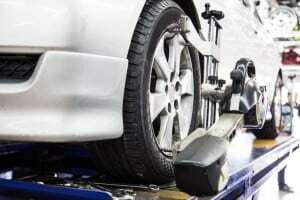 Your car can become misaligned from hitting a pot hole or curb, running into a concrete stall marker in a parking lot, or simply going over a bump at a high speed. At Highway Tire Lube & Auto, we offer wheel alignment services to those in and around Mooresville, North Carolina. We can work on all types of vehicles of all sizes. We typically recommend having your alignment checked regularly, since this will help prevent problems in the future. Highway Tire Auto & Lube is family-owned and operated, and our family dog even spends time in the shop with us! If you need wheel alignment service, bring your vehicle into our shop for a free quote. In addition to wheels and tires, we also offer brake service, transmission fluid flushes, oil changes, auto part inspection and replacement, and much more. We focus on providing excellent service and value for all of your vehicle’s needs. At Highway Tire Auto & Lube, we offer high-quality wheel alignment services to residents of Mooresville, Denver, Sherrills Ford, Terrell, and Lincolnton, North Carolina.